Every year around this time, we are reminded of all that we are thankful for. Here at Gilstrap & Associates, we're all thankful for the rewarding work we do and the people we can help. As we are getting ready to say goodbye to our work family for the holiday weekend and spend some time with our family and friends, it's nice to reflect on what's truly important to us. We asked a few of our counselors to share what they're most thankful for and what Thanksgiving means to them. I am most thankful for my wife. I am thankful for all of the countless ways in which she has been my supporter, my encourager and my anchor in stressful and difficult times. I am thankful for the example she consistently sets in how to love other people well, in how to be hospitable, and how to selflessly serve the people around her. She is my safe haven that I know I can always count on, that I know will always be there for me when I need her most. Without a doubt, I am most thankful for my wife. I am thankful for being blessed with amazing relationships with family and friends. I am thankful for cool Florida winters that offer reprieve from summer. I am thankful for the blessings from God that are big and hard to miss and for the small ones that go by unnoticed that I don't acknowledge on a daily basis. And finally I am of course thankful for my husband and fur-baby, Bailey! I am most thankful for having an amazing, phenomenal, loving, trustworthy Heavenly Father who blesses me consistently, abundantly, and beyond my expectations. Because of God’s love for me, I was blessed with the gift of life which has allowed me to experience the long list of things that I get to be thankful for every day. I am most thankful for my Lord and Savior Jesus Christ and His redemptive work on the cross. I am thankful that nothing can separate me from His great love. I am thankful for my amazing husband. He is truly a blessing and a gift to me. I am thankful for the incredible family and friends the Lord has given me. I am also thankful for my job and the clients God has entrusted in my care. It is a blessing to be part of their journeys. I am most thankful for my family and great friends that show love not only to me, but to others. This is where I am able to feel warmth, happiness, closeness and connection. I feel safe here and am hopeful for a positive future. I am also grateful for the “small” things in life; there are too many to list. But, I enjoy reflecting on the things that are seemingly expectant in life and realizing how much of a big gift they really are. With a thankful heart, I am able to show gratitude to God for His presence in everything. In acknowledging His presence, I am able to have peace in which I am thankful for. Our family is praising God this Thanksgiving that my niece, Louann, survived emergency open heart surgery Tuesday night and was weaned off the ventilator Wednesday morning. We are grateful for our family, friends and co-workers who are praying for and loving Louann as she recovers in Nashville. Thanksgiving has changed in its meaning for me over the years since I was a kid. It has come to represent a very special season for me. A season that means Christmas is coming soon and the kids are out of school. It's a time to slow down and be intentional to spend time with family. It means the best part of football season is upon us, the Gators will play (and usually beat) Florida State! Thanksgiving is a sweet time, and while it is at the end of the year, it always feels like the beginning of my favorite time of year. Thanksgiving to me means the deliberate act of reflecting on and acknowledging all the things in life to give thanks for and following through on the action of giving thanks by telling and showing others and God how grateful I am. Thanksgiving means time to slow down. It means planned time with family and friends—to reconnect and tell stories and play games. It means eating lots and lots of incredible food and watching football games I don't really even care about. It means time to be reminded of what I'm truly thankful for in my life, despite how often I tend to take things for granted. Thanksgiving is a time to reflect on the abundant blessings the Lord has given me. It means quality time with my family and making memories that will last a lifetime. My family has a tradition where we take three kernels of corn and places them in a basket as we go around the table to share with each other the three things we are most thankful for that year. It means so much to me to hear what the Lord has done in the lives of my family. It is a reminder to me of the goodness and faithfulness of the Lord. Thanksgiving is a joyful celebration of the blessings and bounty that our Papa lavishes upon us moment by moment on our earthly journey. Friends, family, food and memory-making—simple pleasures that are priceless. Thanksgiving is about relationship. Giving thanks makes sense only in the context of another. To say thank you to just the air or no one at all has no value. It is empty. So we gather together with friends and family to share in our gratitude and there find purpose and meaning. We give thanks to our Maker so that we may be joined with God and there find peace. On this Thanksgiving, find someone to share your gratitude and be joined with them in a sacred space of wholeness and contentment, if for just a moment. 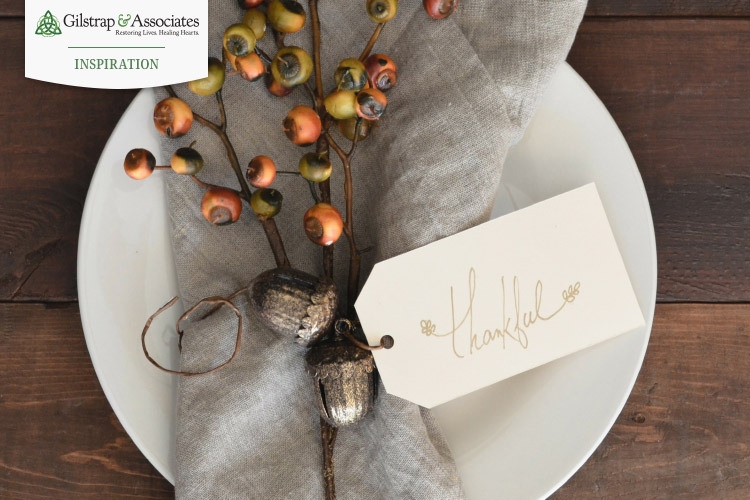 Happy Thanksgiving from all of us at Gilstrap & Associates!